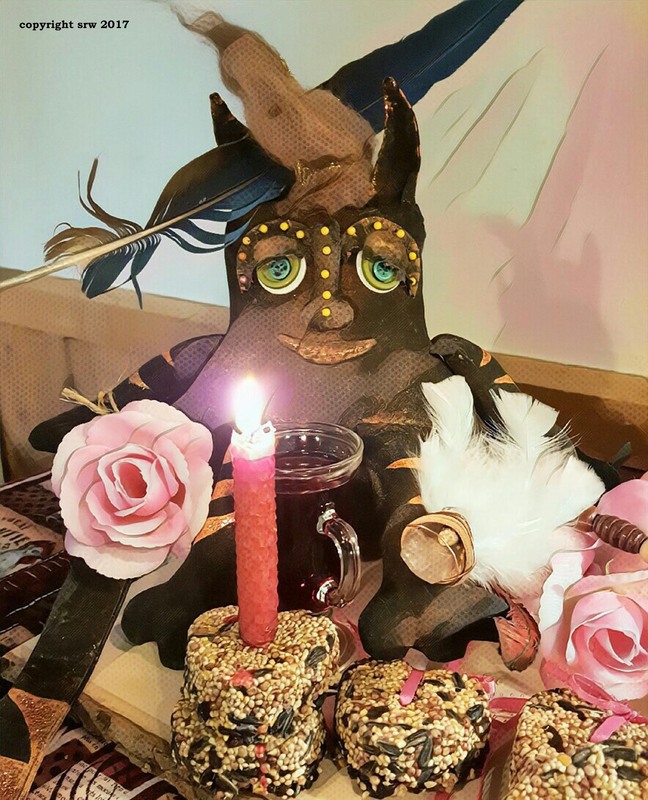 Taco Cat casts a love spell with bird seed cakes and a red candle. As the birds eat the seeds, love will come into his life. January, February, and March in the northern climes can be difficult months for wildlife, depending upon weather conditions and available food source. The arctic air and leaden skies – day after day, sometimes week after week– tend to drive many of us into that winter blues funk. Working on projects to take care of Mother Nature’s children during the coldest months of the year is amazingly fulfilling for both animal and human. Let’s face it – sometimes people have so super hurt us that although we want to be charitable? It ain’t easy. There are moments when we don’t really want to socialize with another drama filled, angst driven person. The shivering temperatures and dull landscape of winter seem to push fears, depression, and dissatisfaction into the bone of our brains. Although tempting, crawling under the covers until winter is over is not an option. Why not spend a few hours, or several hours over the course of a weekend, to make something edible for wild birds? Focusing on animals and their needs can bring that feeling of worth that is necessary for balanced happiness, shift our emotional state to the beauty of the earth and Her gifts, and build unconditional love energy around us. As you create your birdseed delights, daily cares and worries slip away. Gifting the birds your treats at dawn can bring a whole new meaning to the intermingling of human and nature – you just have to allow the happiness to encompass you! 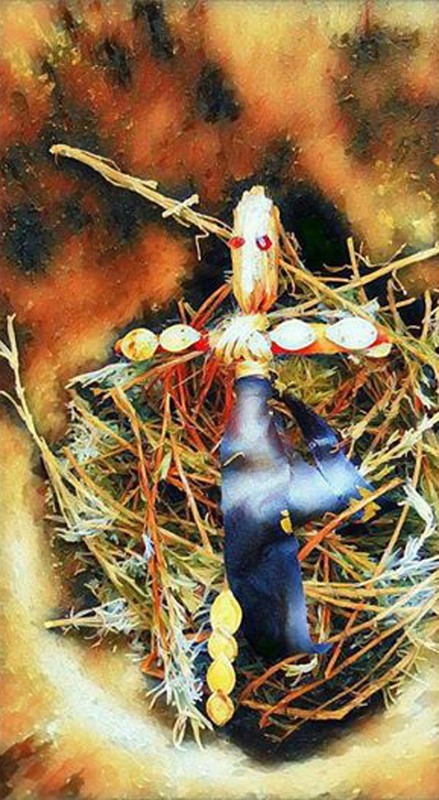 Making food for birds is a wonderful activity to do with your coven brothers and sisters, or perhaps you are looking for an activity to occupy the children. While making the bird cakes or wreath, you can talk about the Gods and Goddesses of the Air, and those that have a particular affinity for birds. Goddesses associated with birds include Rhiannon (Celtic), Isis (Egyptian), Nekhbet Vulture Goddess (Egyptian – hers was the largest cult within the City of the Dead), Hecate (Greek – Shapeshift into an Owl– this also included Blodeuwedd and Arianrhod who could also turn themselves into Owls), the Morrighan (Celtic – Crow/Raven), etc. You may wish to spend some time doing a search on the internet for bird mythology as it relates to both male and female divine. Many shamans in a number of cultures thought that birds gifted them with second sight. Birds are often associated with creation myths, the element of Air, and the ability to speak with spirits. This article contains three formulas for preparing wild bird food. 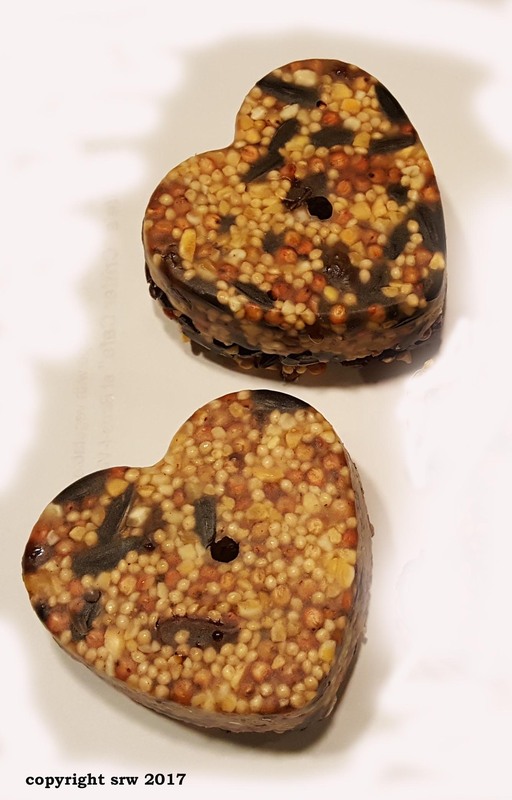 I have combined the recipes with some of our upcoming holidays – A Wreath for Candlemas, Heart Shaped Cakes for Valentine’s Day, and Golden Suet Patties for Spring Equinox. 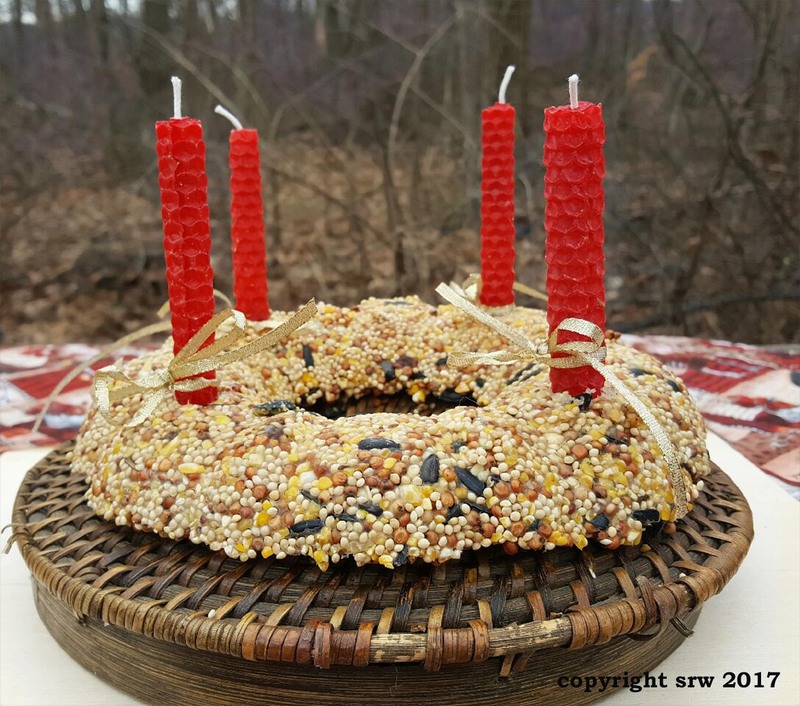 Candlemas Bird Seed Wreath made with a bundt pan — you can use either side of the wreath as your decoration. This is the easiest of the three formulas. It takes only a few minutes to prepare; however, it should be made at least 24 hours before the holiday. You can use a bundt pan as in the illustration here, or you can use individual silicon molds that come in a variety of artful shapes. In this example, the bird seed wreath was used in a birthing ritual for a pregnant woman — asking for her protection. The wreath can also be used for new growth of a business, hobby, or project. Tip: Know beforehand the dish or platter that will be the decorative part of the wreath offering for the ritual. This way, when ready, you can immediately transfer the wreath onto the surface without breaking. The less you handle the wreath, the better. 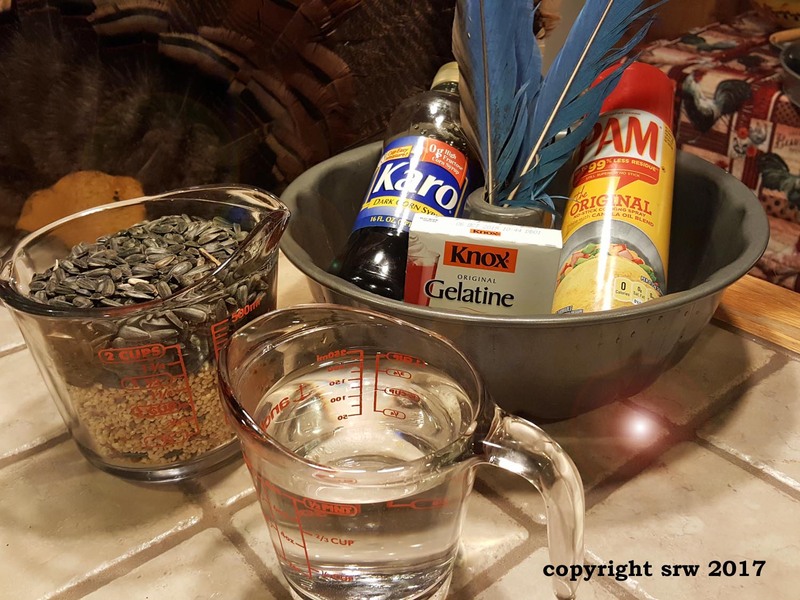 Simple ingredients for Bird Seed Wreath. Mix the birdseed and egg shell together. Spray Bundt pan with Pam cooking spray to prevent finished wreath from sticking to the sides of the pan. Fill pan with bird seed mixture. Shake from side to side to level the birdseed. Boil 1 cup of water. Slowly stir in gelatin (2 packets) until dissolved. Pour liquid over birdseed. Place mold in the refrigerator for 30 minutes. Check to see if it is thickening well. Use a chime candle to make four holes if you wish to use the wreath as your Candlemas centerpiece. Leave wreath in the refrigerator for 2 hours. Move to the freezer for 2 hours. Remove from freezer, and let the mold rest for approximately 10 minutes. Turn the mold upside down on a piece of wax paper that is already sitting on your chosen decorative plate. Tap gently until wreath slips onto the paper. It is very delicate at this point. Allow to dry for 48 hours before decorating. You will be able to remove the wax paper right before the ritual. Note: If you do not wish to use gelatin, raw flax seed can be boiled down to make a gelatin type substance. However, the birdseed ring will be extremely delicate, and I recommend using a food dehydrator to remove all excess moisture. 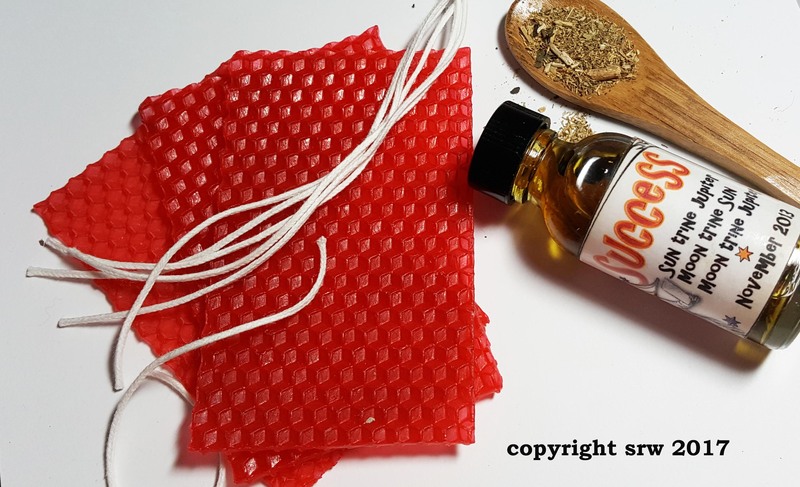 The Magick: The picture shown above has hand rolled beeswax candles dressed with motivation magickal powder, universal fluid condenser and success oil. Ribbons were tied to the candles. Care was taken as the candles were burning to ensure that none of the wax dripped onto the birdseed ring. The ring itself was empowered for joy, happiness, love, and well-being of the coven as well as nature’s family. After the ceremony, the birdseed ring was taken to the woods and given to the wild birds. I whispered this chant as I prepared the cakes, and then again before I took the cakes outside to give to nature. 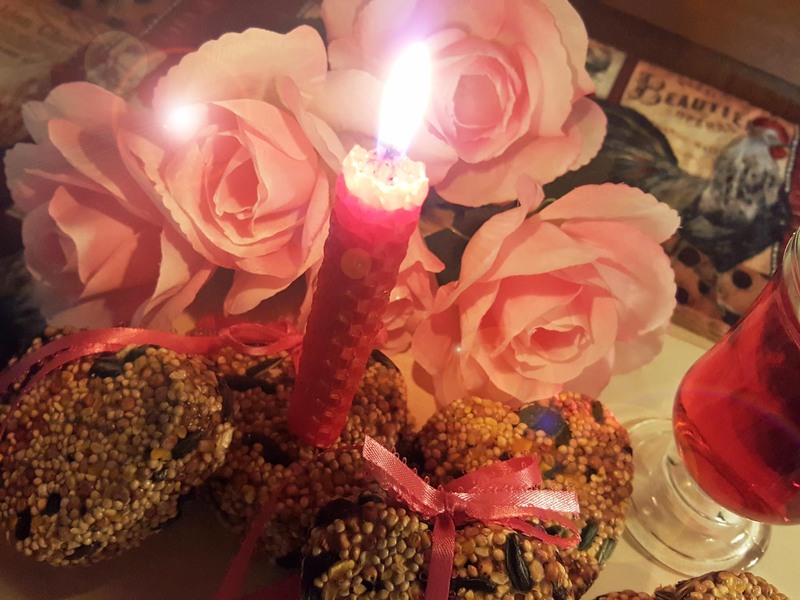 For good fortune – make the cakes on a Thursday (Jupiter Day) or a Sun Day in the planetary hour of Venus, the Sun, or Jupiter (depending upon the nature of the good fortune you desire) when the moon is waxing. For Love, I would choose Friday (Venus Day) in the Planetary Hour of Venus when the moon is waxing. The Magick: Pour the corn meal onto a flat surface covered with the wax paper. Draw sigils, initials, or words in the corn meal that represent your desire. Seal this image by drawing an equal-armed cross in the air over the corn meal. Put the cornmeal back with your other supplies until you are ready to make the cakes. As you make the cakes, intone your favorite chant or the whisper chants given above. Making the Cakes: In a large bowl mix the birdseed, Karo Syrup, Peanut Butter, Raisins and corn meal. Mix well – use your hands if you have to so that the peanut butter and syrup is spread throughout the birdseed. Spray the molds with the Pam cooking spray. Boil the water and slowly stir gelatin into the water. When gelatin powder is completely dissolved, pour the warm liquid over the birdseed mixture. Mix thoroughly. Quickly spoon warm mixture into molds. Pack as tightly as you can. 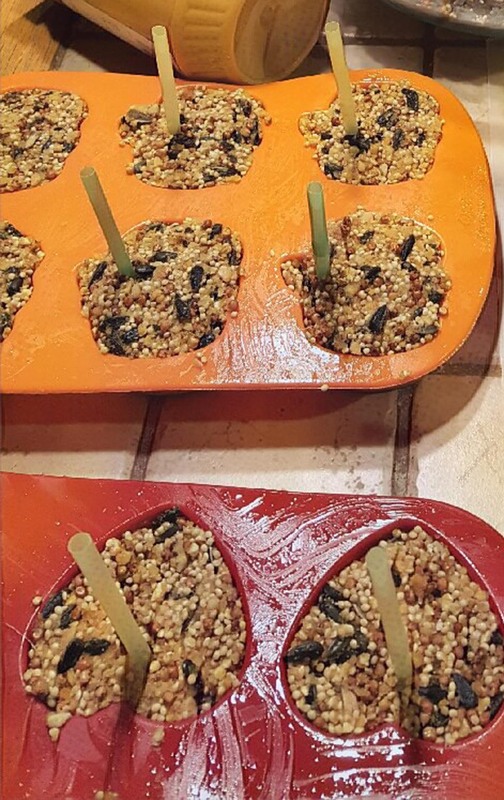 I use a flat wooden spatula to really press the seed into the mold. Place one straw in the center of each cake. Push it all the way to the bottom. Placing the straw in the center keeps the string or ribbon from tearing through the cake. Refrigerate for 2 hours. In this example, we used pumpkin shaped (good fortune) and heart shaped (love) silicon molds. 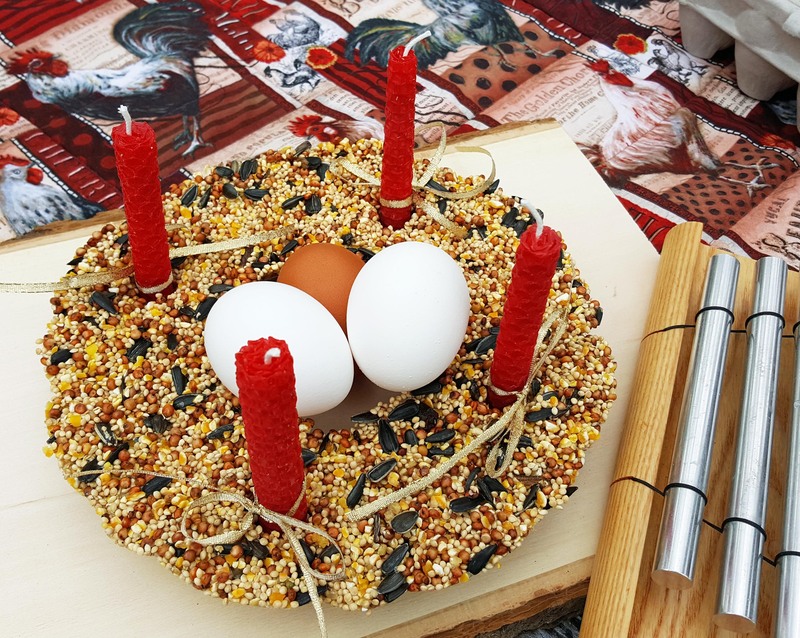 At this point, the cakes can be used in magick (such as further spell work or ritual) and then given to the birds. However, if you want your cakes to be more stable and not so squishy – let them set out and air dry for 48 hours OR place them in a food dehydrator for 7 hours at 115 degrees – my cakes were 1.5 inches thick – if your cakes are thinner, it will be less time in the food dehydrator. 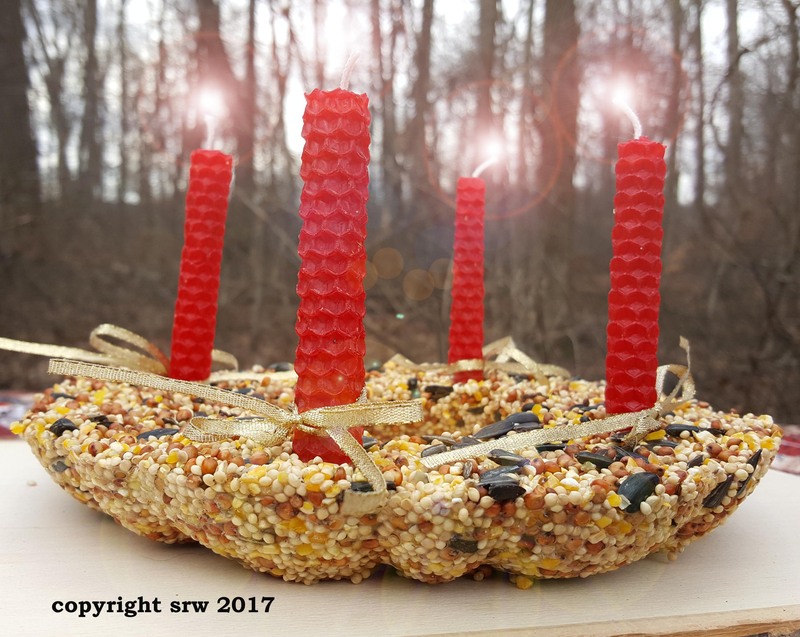 Add ribbon or twine if you wish to hang the decorations – or you can simply crumble them after the magick is completed and put them in a flat pan birdfeeder. Taco Cat helping to spread the suet blend into the glass pan. This is a fast and easy 5-minute recipe; but, I warn you – it is rather messy! Although I tried using cookie cutters with the finished product – I didn’t have much luck. Perhaps you will do better! I ended up using the standard 4 x 4-inch patties for the suet basket (shown with Taco Cat). The color of this mixture is Golden, and it is filled with healthy ingredients for our feathered friends who flock to it as soon as we put it out. The Magick: As with the previous recipe, the corn meal is enchanted before it is added to the other ingredients. Pour the corn meal onto a flat surface covered with the wax paper. Draw sigils, initials, or words in the corn meal that represent your desire. Seal this image by drawing an equal-armed cross in the air over the corn meal. Put the cornmeal back with your other supplies until you are ready to make the suet. As you make the suet, intone your favorite chant or the whisper chants given above. Drop Crisco and peanut butter in microwave-safe bowl. Spray glass pan with Pam cooking spray. Melt Crisco and peanut butter in the microwave for 1 to 2 minutes (depending on your microwave). The mixture should be lightly creamy as you stir – not runny. Stir well until Crisco and peanut butter is thoroughly blended. Add all other ingredients and continue to stir. Place mixture in the glass cake pan. Put in the freezer for approximately 4 hours. Remove from glass pan. Day’s end will reveal that all will be well! Put the suet patties in the suet cage, fill suet logs or spread on the bark of trees. 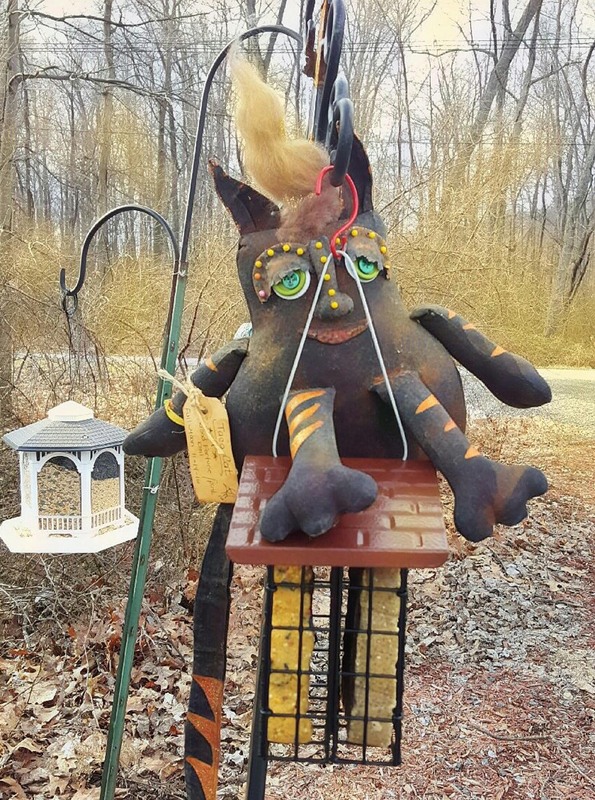 Taco Cat honors the gifts of the Gods and Goddesses of the Air. He is sitting on the Suet Basket, eager to commune with his feathered friends. And, just so you know — Taco Cat prefers Pizza rather than creatures of the sky. I hope that you have enjoyed this selection of crafty magick! Until we meet again! PS: Look next month for enchanted organic dog biscuits! You can use them as offerings to Hecate’s Hounds! I’d like to thank everyone that participated in the week-long program this year. To me, it went extremely well and the 8-day format was something I could handle both in the creation and implementation. I liked running the program after the holiday season, although I didn’t expect the emotional rollercoaster it presented on various days — which you may have experienced yourselves. Given that we packed a great deal within just 7 days, with body, mind and soul effort, there was bound to be some fallout — whether it was emotional or event-oriented, due to our hard work. Our purpose was to “shift” the energies — and we surely did that! The most successful portion of this year’s program, I think, was the Need Dolly — called by some participants the “Needy Dolly” (which I rather liked because the title spoke on many levels). As I am currently finishing up a spirit doll book, I will be adding the Needy Dolly to the work along with our experiences from this program with that particular magickal vehicle. The Needy Dolly? I consider her the Magickal Boots on the Ground for this season’s release program! Releasing the Need Dolly in ritual circle. In other areas of my life, I actually managed to finish my offensive closet — which had escaped my repeated efforts on several occasions in the past three months. I was able to donate 10 bags of clothing, and clean out the bedroom closet as well, along with the other daily tasks. All junk drawers are cleared (we won’t share how many I actually have — it will be our little enchanted secret). 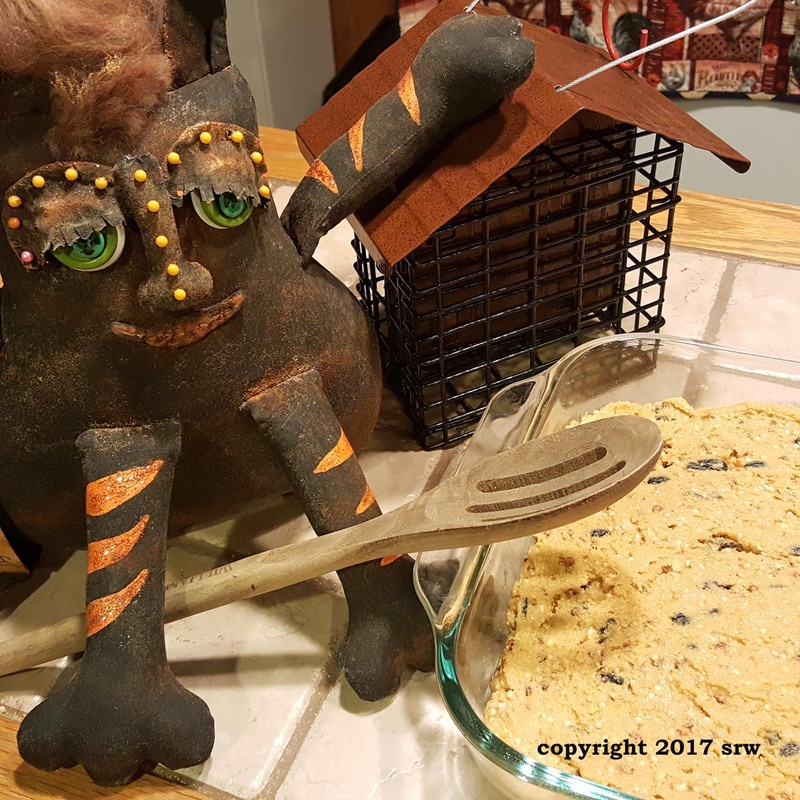 On the uplifting and magickal task-oriented side of life this past week, I created two new “dollies” which will also be in the spirit doll book. Taco Cat and I thank you so much for your interest in the program this year! The energy was fantastic and we could feel the participants working all over the world! Sweden, France, England, Australia, Canada and more — it was a pleasure to be with all of you! Taco Cat and I will put together another program — perhaps for MidSummer? 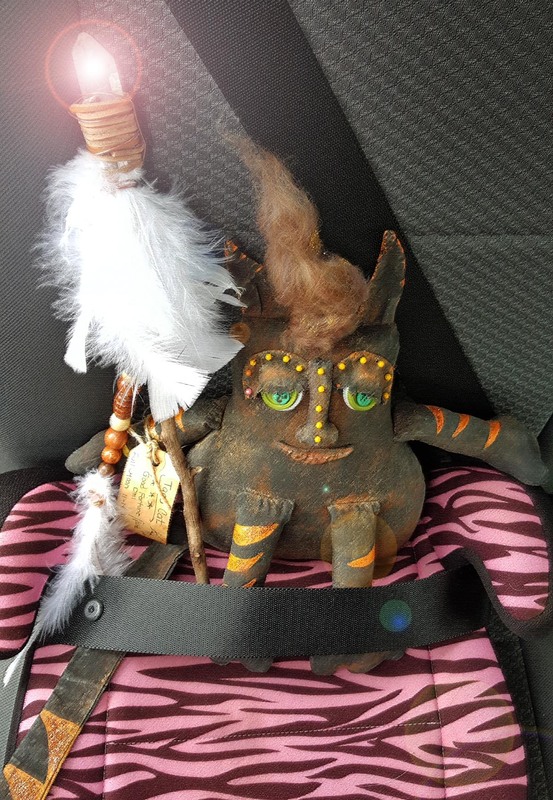 Until then, I have Taco Cat buckled up for a road trip! We’re going to have a little fun and catch us some Pokemon! Taco Cat preparing for a road trip.